"sibog-sibog lang ta igo pa lagi..."
ahhh. public transportation at its best. 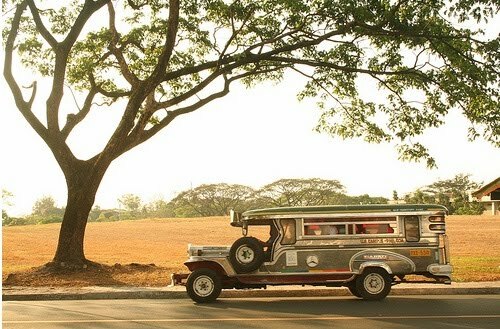 but noo, its not only that... there is more to the jeepneys we have grown to like errr to tolerate more like it. yes, there are those small types of jeepneys that let you meet other peoples knees. knees in contact. i hate riding one of those, i have nothing against knee meeting and knee meet and greet its the challenge of going in and out of the jeep successfully. damn knees. no offense to them chubby ones but i need to let this out of my chest once and for all - "MOVE YER FREAKIN KNEE TO THE SIDE!!" that way its easier for one to move in and out of the jeep without resistance. ahhhh, this is one is epic. there are different types of people inside a jeep and they need not be endured, yet we do try our very best. so, one wants to pay. no one would want to receive the fare til i do. damn these people. im not really annoyed at getting the fare and passing it over to the driver but damn, why cant peole just be that considerate? did they even think that if we dont pass the fare everyone would have to move over next to the driver and pay? mornings, afternoons and even at night what is it with people who dont have the decency to tie their hair up when riding public transpo? i hate it when they just let it all smear on your face. you would be so lucky if it’s not wet or worse lice-infested. geez, tie your hair up! i need a ride not a snack from your hair. nothing beats the cold breeze on yer face but a warm smell of armpit aroma! its not really necessary to bathe if yer pits dont smell but please if you think your sebaceous glands are actively working, kindly close yer pits and let us breath the oxygen mixed with carbon monoxide. ahhh, the notorious mokong! slang for people who thinks jeepney rides are free. some do it for reasons like: they dont have money and can’t pay, others forget to pay for other reasons they only know of and some for the heck of it. i have no idea where all the allure of the last seat on jeepney started. i think it’s because you can just jump and run when a thief starts to mug the vehicle or to flee at the onset of accident or to walk idly and pretend you paid even you didnt. so one takes the territory of it then comes someone who could be one of the following: an elderly who can’t really bend their knees well, someone with a big luggage or a plastic full of stuff id rather not know or someone who just wanted to piss you off by saying: "sibog daw gamay" or just shoves yer bum and thinks they deserve and earned the coveted seat. lately ive been hating any song from Justin Beiber, i think he needs to kill himself. id go on with my whole life not knowing him and not hearing his tunes yet the one on your left started to hum his tunes then sings. you check the person out and lo and behold he has an ipod/mp3 or whatever portable music device he has in tow. he sings "baby, baby, baby.. ohhhhh.." crap. its tolerable but damn after you disembark from the jeep and move on with your day the song is like piercing thru your ears and lasts the whole day. damn. why is this such a pain? to add a bit of info. i read somewhere that jeepneys were supposed to be military transpo back in world war 2, pinoys being the resourceful people that we are got it pimped up: added metal for a roof and the vibrant colors and of course the route and the names of all kids the driver has sprawled over the vehicle inside and out. routes from the farthest land to the next mall. fares ranging from php5 to php25 and depends on where your headed to. i guess some of these has happened to you or i bet you got far more interesting stories to share but this is what i compiled so far. i laughed so hard when i read about "poker face"! hahahahaha!i luuuvvvv it! so pinoy! thanks! :D glad you guys enjoyed it!